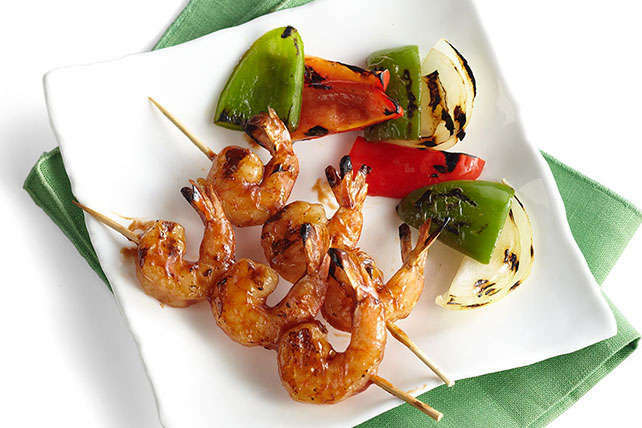 Grilling doesn't get any easier than this BBQ Shrimp. It's nothing but sauce and shrimp—grilled to perfection. Thread shrimp onto 8 skewers. Grill 2 min. on each side or until shrimp turn pink, brushing occasionally with barbecue sauce. Prepare as directed, threading about 3 cups cut-up fresh vegetables (red or green pepper chunks, mushrooms, cherry tomatoes, sliced zucchini and/or onion wedges) and/or pineapple chunks alternately onto skewers with shrimp. If using wooden skewers, soak them in water for about 30 min. before using to prevent them from burning on the barbecue.